Personal items belonging to the late famed theoretical physicist Stephen Hawking sold for hundreds of thousands of dollars this week after the Christie's auction house made available several pieces, including a red motorized wheelchair. The sale, which was held online by the auction house on Thursday, collected more than $1.8 million, breaking past pre-sale expectations, according to AFP. The online auction was named "On the Shoulders of Giants," a reference to a phrase coined by mathematician Isaac Newton. 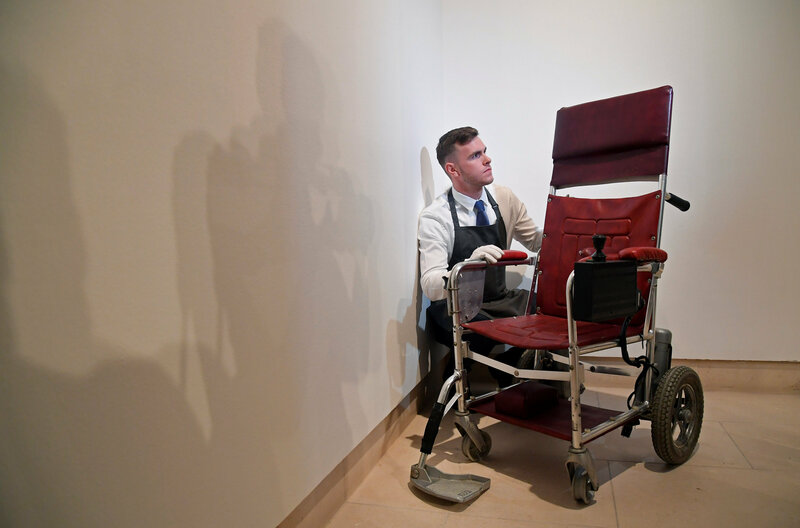 Fine-art handler Tom Richardson poses with a motorised wheelchair belonging to British theoretical physicist Stephen Hawking ahead of an auction of items from Hawkings' personal estate at Christie's in London, Britain October 30, 2018. Hawking's red and maroon leathered, motorized wheelchair, which the Oxford native used from the late 1980s to the mid 1990s, sold for nearly $400,000. The chair was initially expected to sell for roughly between $13,000 and $20,000. All proceeds from the wheelchair will go to the Stephen Hawking Foundation and the Motor Neurone Disease Association. Other items included Hawking's bomber jacket, time traveler's invitation to a party, the original production script from his appearance on "The Simpsons" and a collection of his awards and medals that sold for more than $380,000. A handwritten page is seen from a copy of the 1965 PhD thesis by the British theoretical physicist Stephen Hawking ahead of an auction of items from his personal estate at Christie's in London, Britain October 30, 2018. However, the most expensive item that sold earlier this week was a copy of Hawking's PhD thesis, titled, "Properties of expanding universes." The work is signed twice by the physicist and includes the notation, "this dissertation is my original work." The 1965 thesis, which is one of five known copies, sold for nearly $800,000. "The results of this remarkable sale, with more than 400 registered bidders from 30 different countries, demonstrate the enormous admiration and affection with which Stephen Hawking was viewed around the world," Thomas Venning, the head of books and manuscripts for Christie's, and James Hyslop, the head of science and natural history, told the New York Times in a joint statement. 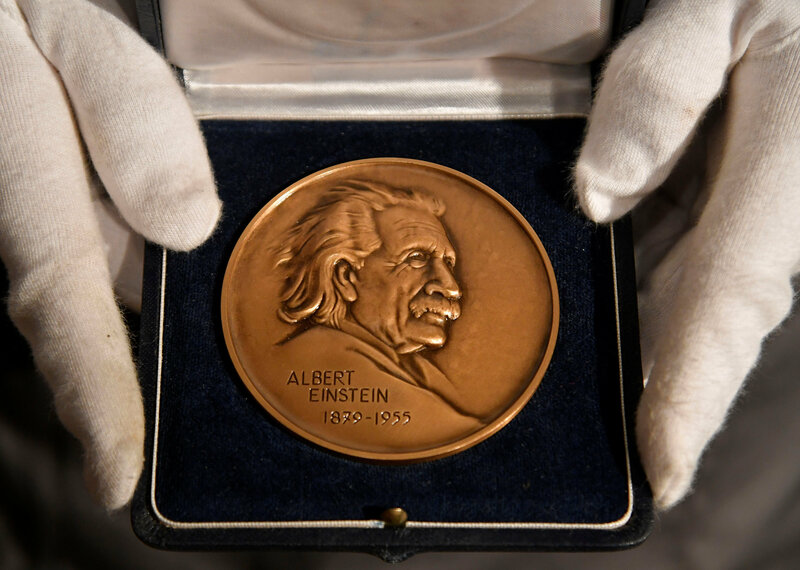 Fine-art handler Tom Richardson displays The Albert Einstein Award given to the British theoretical physicist Stephen Hawking ahead of an auction of items from Hawkings' personal estate at Christie's in London, Britain October 30, 2018. Hawking's belongings, however, weren't the only ones included in the 52-item strong lot. Pieces tied to the likes of Newton, Charles Darwin and Albert Einstein were also included. According to the Guardian, Hawking's children are planning on donating the remainder of their father's estate to the nation "in lieu of inheritance tax." Christie's is reportedly handling the negotiations for the family.